What Ever Happened to the Thrifty Scot? The Scots are renowned, historically, for being canny and thrifty. With latest opinion polls suggesting that around 50% of the folk currently living in Scotland plan to vote YES to the break-up of the UK, it would appear that only one half of the thrifty folk remain in Scotland. The rest must be living in other parts of the UK or in other parts of the world. This comes late but it comes and should find you interest. Hoping to see you at the mill on Sept. 13th. a few mails slipped our before we could complete them, sorry. Here is the "real thing". In the centenary of the Great War, there has been a reflective mood in Britain, and particularly in Northern Ireland, where the war formed part of the complex train of events leading to the establishment of the modern state. Much of the commemoration has focused upon the 36th Ulster Division, raised from the Ulster Volunteer Force, whose sacrifice on the Somme has entered loyalist folk memory. The story of the 36th was told in a book published in 1922 by Cyril Falls, a Dubliner who had served on the divisional staff. Falls’ book is still in print, and the 36th is widely commemorated on murals in loyalist working-class areas throughout Northern Ireland. In the years following partition, there was a deliberate forgetting of the role of Irish Catholic soldiers in the war. Their sacrifice seemed to fit neither loyalist nor nationalist narratives. In the years leading up to the centenary, however, there has been an increasing focus upon the 16th Irish Division - recruited largely from John Redmond’s Irish Volunteers, and as politically committed to Home Rule as the men of the 36th were to opposing it. The story of the 16th has been told in books such as Terry Denman’s Ireland’s Forgotten Soldiers, and the publication by a Falls Road community group of The 6th Connaught Rangers which recounts the history of the battalion of Belfast nationalists that served with the 16th. 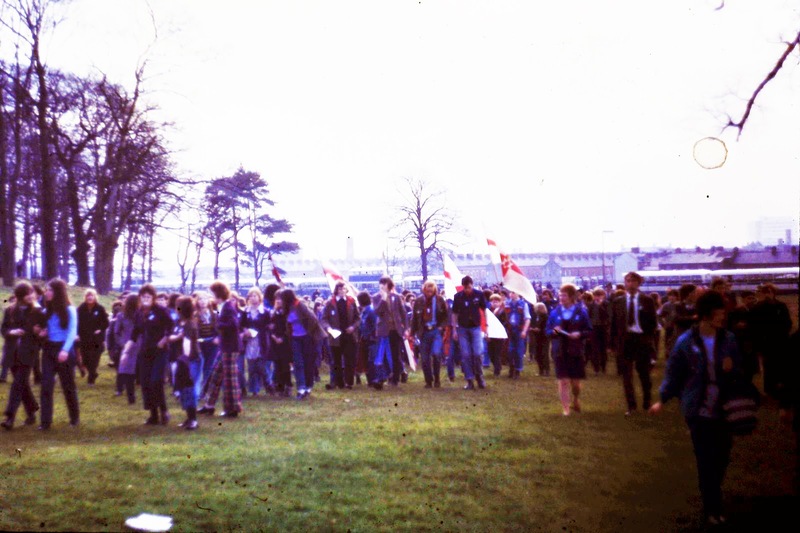 The 36th and 16th Divisions have come to be seen as emblematic of loyalist and nationalist contributions to a common struggle, and of the common ideals that underlay their opposed political positions. This use of remembrance to find common ground was most evident in the opening of the Island of Ireland Peace Tower on Messines Ridge, site of the battle where the 36th and 16th Divisions went into action side by side, the bonds they built being most poignantly enacted when loyalist soldiers of the 36th carried the body of Tom Kettle, nationalist MP and officer of the 16th, from the battlefield. The Peace Tower was opened in 1998 in a highly symbolic act of remembrance by the Queen and Irish President Mary McAleese, with representatives of both British and Irish armed forces taking part in the ceremony. The focus on the 36th Ulster Division and the 16th Irish Division is representative of loyalist and nationalist contributions to a common cause has been positive in many ways, but an unintended consequence seems to have been the total forgetting of the first Irish Division to be formed, and the first to be committed to action: the 10th Irish Division. The 10th was formed in the early days of the war as part of Kitchener’s ‘New Army’. The 10th was unconnected to political militias, and its recruits were a widely assorted bunch, coming from every province of Ireland and beyond. The division attracted large numbers of Belfast loyalists who were not prepared to wait for the organisation of the 36th, fearing the war would be over before they got to the front, as well as nationalists who produced unofficial green flags that were carried on parade and into battle along with regimental colours. Whilst most recruits were working men, D Company of the 7th Royal Dublin Fusiliers was recruited at Lansdowne Road through the IRFU, and consisted of barristers, solicitors and others from the middle-class professions. Whilst ‘Dubs’ were popularly known as ‘the old toughs’, D Company was known as ‘the toffs in the toughs’. In contrast, Bryan Cooper, an officer from County Sligo who published a history of the division in 1918, noted that many of those who adapted quickest to the demands of life in the field were Irish Travellers, a group whose contributions have rarely been recognised north or south of the border. 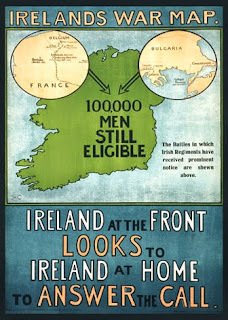 Recruitment was boosted by a sizeable contingent from England, many of Irish descent. 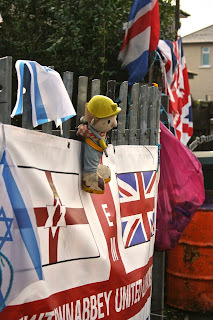 Cooper noted that many of the English were miners and militant trade-unionists, and officers had to earn their respect. This they had in common with a large contingent of Dublin dockers who had been blacklisted by employers for their loyalty to Jim Larkin during the Dublin Lockout of 1913. Whilst for the dockers, and many others, enlistment was an escape from unemployment, the former miners, like ‘the toffs in the toughs’, took a significant paycut in order to serve. The officers of the 10th were as diverse as the men, former Indian army officers, retired officers from regular Irish regiments, young men from Trinity University Officer Training Corps and officers of the Royal Irish Constabulary all played a role. On August 7th, 1915, whilst the 16th and 36th were still training on home soil, the 10th Irish Division transferred from troop-carrying ships to barges, to launch a beach assault alongside the ANZAC’s (Australia & New Zealand Army Corps) in Suvla Bay - an attempt to break the stalemate on the Gallipoli peninsula, where Churchill’s plan to seize the Dardanelles Straits and open the way to support Russia in the Black Sea had bogged down against fierce opposition by the tough and well-trained Turkish army. They were not the first Irish troops to enter the campaign. Regular battalions of the Royal Dublin Fusiliers and Munster Fusiliers had been decimated in the initial landings. The 10th fared little better. Cooper describes how they fought in the hot arid conditions, often without water, how assaults against Turkish machine-guns sometimes led to whole platoons just disappearing, and how ferocious fighting at close quarters ultimately led to the division losing 75% of its original strength - Dublin dockers and Belfast loyalists, English miners, Irish Travellers and rugby-playing ‘toffs’ perishing together amid the dust and flies. The desperation of the fighting is illustrated by the story of Private Wilkin of the 7th Dublins, who caught five Turkish grenades and threw them back at the enemy, before the 6th blew him to pieces. The operation commander, Sir Ian Hamilton, noted that the division had proved wrong the idea that no military unit could remain effective once it had lost 25% of its strength - the spirit of the 10th never broke. The remnants of the 10th Irish Division was withdrawn from Gallipoli to the Greek island of Mudros at the end of September 1915. The entire allied force had withdrawn by the first week in January, the ambitious mission having ended in total failure despite the enormous sacrifices made. Cooper ended his book with the phrase: ‘Ireland will not easily forget the deeds of the 10th Division’. It seems he was wrong. Whilst the victory at Gallipoli formed the foundation of modern Turkey, and the memory of the ANZACs became central to the national identities of Australia and New Zealand, in Ireland the sacrifice seems to have faded from the memories of both north and south. Perhaps this is because the 10th did not fight on the Western Front, seen as central to images of the Great War. Perhaps it is because the strange hodge-podge of loyalists, nationalists, travellers, trade-unionists and what today’s Irish regiments call ‘plastic paddies’ which made up the 10th did not fit anyone’s political narrative. It seems even when we remember shared sacrifices, we still like to see a clear division between ‘us’ and ‘them’. We should remember the 10th, however. Their sacrifices were as great as any made on the Western front. Their motives were no more or less noble than any other division. After their withdrawal from Gallipoli, the division was redeployed to the Balkans, and fought the Bulgarians in Kosovo, a theatre familiar to today’s Irish Army and Royal Irish Regiment, before going on to face the Turks again in Palestine. In many ways, the mixed composition of the division was similar to the Irish regiments of today, which recruit from Northern Ireland, the Republic of Ireland, England, and beyond. And they are a reminder that there is no clear division between ‘us’ and ‘them’ - indeed, a close look at the histories of the 36th and 16th Divisions shows that they too rapidly became ‘mixed’ formations after the casualties of the Somme. There are some signs that memories of the 10th are being rekindled. Cooper’s story of the Division at Gallipoli was republished in 2003, and a 2006 book, Field of Bones, by Philip Orr has explored the experience of soldiers from the division both in battle and after the war ended. This is to be welcomed. Regardless of their origins or motivations, the men of the 10th fought together, and way too many of them died together. They deserve to be remembered. On 2nd April 2007 I had the pleasure of seeing a live performance by arguably the best guitarist to ever come from Northern Ireland and one of the best in the world in his field. I am speaking about Gary Moore, blues rock guitar hero and the go to guy for Thin Lizzy when their other six string toters abandoned ship. This concert will forever be etched in my memory for two main reasons. 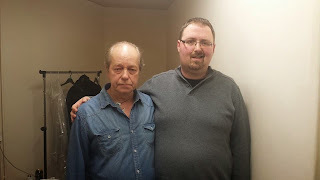 One was that I managed to get backstage due to a chance meeting with Gary’s father. The meeting backstage was brief but very gratifying. I had my photo taken with him and he also signed a DVD. The other was that it turned out to be his last ever Belfast date. On 6th February 2011, Gary passed away in his hotel room in Estepona, Costa del Sol, robbing him of the opportunity to play his hometown again. This was another strange twist of fate for me as a couple of years previously I had been living just 30 miles along the coast in Algeciras. The Ulster Folk will be one of the proud sponsors of The Fest at Raceview Mill. This new festival will celebrate the launch of Roy McKeown’s inspiring vision for the Old Raceview Woolen Mill in Broughshane. We are excited about this festival that will have something on offer for a diverse range of people. There will be tasteful crafted foods and beers, artwork, linen clothing and a range of music and entertainment that will appeal to those urbanite artsy new-agers who would not want to go near yet another traditional country fair. The search for the elusive Catholic Unionist vote is far from an “exercise in folklore” as Alex Kane maintains, it’s a journey into the very real no man’s land of Northern Ireland politics. Savile Saga Rumbles on - But not yet in Northern Ireland. He wined and dined with the head folks in BBC, police, politicians, government agents, Roman Catholic Church (he was even blessed by the Pope), Royal Family, IRA, other big celebrities and business tycoons. I know I’m forgetting somebody. Many are the wild conspiracy theories, and what can you expect with such a massive cover-up as is now being gradually exposed? The scale of the whole saga and the scale of the cover-up are truly disturbing. What is also disturbing though: why no word yet on what he got up to in Northern Ireland? 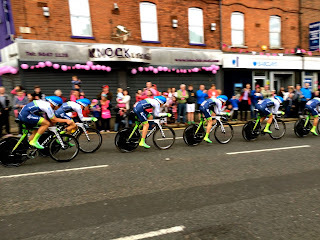 GIRO - FACILITATING LOCAL ECONOMIC BOOM? 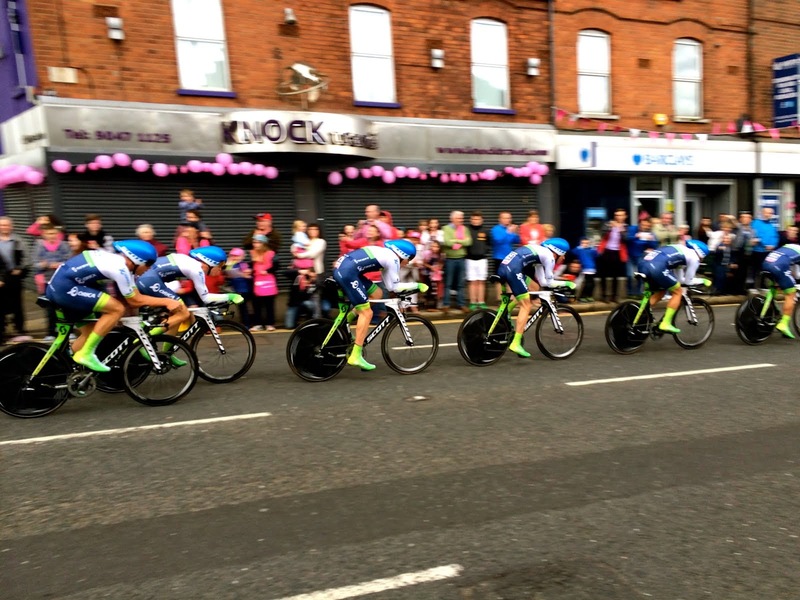 The Giro D'Italia has left these shores costing in excess of £5million. The Northern Irish Tourist Board expects the event to generate some £2.5million for the economy and global media coverage worth £10million. This event could be the spark that ignites the Northern Irish economy, not through tourism but through manufacturing and exports instead. To grab the potential of this future though will require imagination and determination from the people of Northern Ireland. The trouble with researching the history of the Troubles in Northern Ireland is that many people are still searching for grand narratives - both theoretical and ideological. One of the casualties of this approach is that we miss the micro-history; the social history and the lived experience. The Boston College controversy has made capturing oral history a much more difficult but not impossible task. Over the past year I have been interviewing and recording the stories and memories of a number of men from Protestant working class areas of Belfast who were teenagers at the beginning of the 1970s. Many of these young men were members of loyalist ‘Tartan’ gangs. The Ulster Folk will be one of the proud sponsors of The Fest at Raceview Mill. 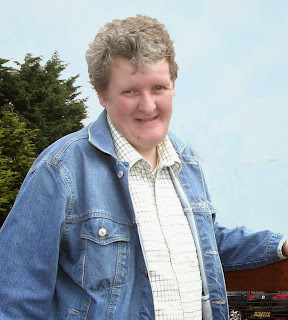 This new festival will celebrate the launch of Roy McKeown’s inspiring vision for the Old Raceview Woolen Mill in Broughshane. We are excited about this festival that will have something on offer for a diverse range of people. There will be tasteful crafted foods and beers, artwork, linen clothing and a range of music and entertainment that will appeal to those urbanite artsy new-agers who would not want to go near yet another traditional country fair. Yet, local Ulster-Scots style folk music, on everything from fiddles to Lambegs will celebrate the rich heritage of Broughshane and County Antrim. The Fest will consciously support the local economy by showcasing local food and drink producers, artists, artisans and musicians. It will promote awareness of local independent sustainable enterprise: pay tribute to the innovation and work ethic of those from days of yore while heralding the dawning of an exciting new entrepreneurial age. Yes there is a new age, set to blossom soon at Raceview Mill. This is why The Ulster Folk is on board. The Scottish Referendum: the potential divorce. On May 2nd, I attended a presentation on the upcoming Scottish Referendum at Queens University Belfast. It was delivered by Dr Michael Rosie of University of Edinburgh. [Dr Rosie is Senior Lecturer in Sociology at the University of Edinburgh and Director of the University’s Institute of Governance. Dr Rosie specialises in studying the political sociology of Scotland. The event was facilitated by Professor John Brewer of the Institute for the Study of Conflict Transformation and Social Justice at Queens]. Dr Rosie is a man well-versed on the subject matter of anything Scottish. His presentation was delivered with great ease, comprehensive and quite entertaining. No pretentions with this academic: excellent lunchtime entertainment. I didn’t really learn an awful lot as I have been following the referendum debate but there certainly were a lot of issues confirmed with much meat added to the bones. In a nut shell the situation is that the polls still give the NO voters a slight edge and there are complex reasons as to why the Scots are taking their various stances. What was not clarified for me were issues relating to the following: membership of the EU, membership of the British Commonwealth, currency, defence, and fees for students. Dr Rosie straight away denounced the extremist elements in the debate in Scotland and presented an image of mature civilised debate among the majority of Scots. It would of course be virtually impossible for an academic Scot not to have a personal opinion and while he did his best to present both sides of the argument he was clearly a YES supporter. You couldn’t help get the feeling that the desire for independence was primarily for the enlightened progressives and those against were from the old school. 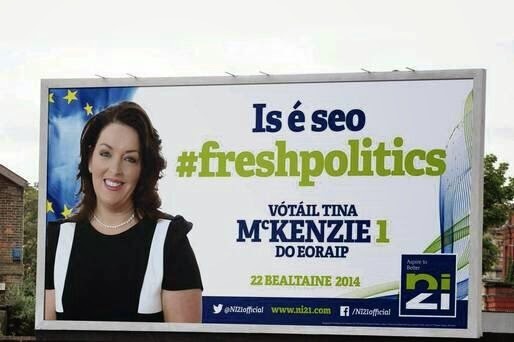 Aside from the dissident fringe of Republican Sinn Fein, most Irish eurosceptics believe it is better to milk Brussels for what it is worth while deriding it every chance they can get. A lot of this is an outgrowth from the practical nature of Irish politics that has taken to heart that "all politics is local." Irish politics has long been defined not by ideology or issues but by the warm, personable, often-corrupt and petty 'clientelism' of constituency politics. Example: How can you vote against Jimmy? After all he helped fill in that pothole outside your home, pulled a few strings for you that one time ; and was at your mammy's wake! The Ulster Folk on the move. The Ulster Folk have moved office to join the exciting hub for enterprise and the arts at Raceview Mill. We fully support the vision and aspirations of mill owner Roy McKeown. Enthusiastically looking forward to the many projects of innovation the Raceview Mill will undoubtedly engage. The Ulster Folk, Raceview Mill, 29 Raceview Road, Broughshane, County Antrim, BT42 4JJ. Telephone 028 25 862 106. www.theulsterfolk.com. 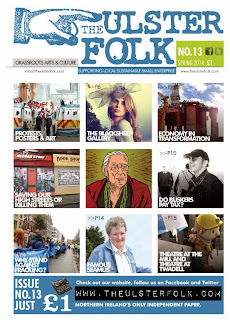 Email:info@theulsterfolk.com. Our local drink scene went the same way as food. It used to be that a bottle of Guinness stout tasted slightly different when bottled in Ballymena than it did when it was bottled in Belfast or Dublin. They don’t bottle it in Ballymena anymore, as a matter of fact it’s now hard to find bottled Guinness full stop. But if they did bottle it nowadays in Ballymena it would taste identical to stout bottled in Bali or Bahrain. The Ulster Folk will be a major sponsor and organizer for the new Fest at Raceview Mill. Showcasing the excellence of local food, crafted drinks, arts and music. 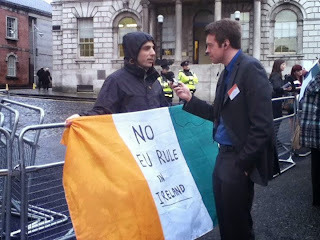 Under the direction of a Ballymena man long based in Paris, a widely-refereed academic journal published by the Presses Universitaires de Rennes and dedicated to reviewing the history, civilisation and literature of Ireland has shone an intense spotlight on matters close to home and heart. In the latest edition of Études Irlandaises (Autumn/Winter 2013: 38.2), under the title ‘Ulster-Scots in Northern Ireland today: Language, Culture, Community’, Wesley Hutchinson of the Université Sorbonne Nouvelle-Paris 3 has gathered contributions from various pens on matters pertaining to what more than one article renders concrete as ‘the Modern Revival Period’, a term of obvious presupposition. Against a wide-ranging theoretical background, Hutchinson’s own prefatory piece, ‘Ulster-Scots in Northern Ireland: From Neglect to re-Branding [sic]’, indicates fronts being explored very seriously in a context which, at street level, has in the past had its moments of derisive notoriety, often but not wholly caused by tabloidery. 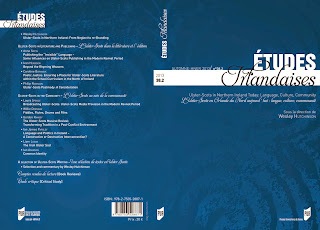 French journal on Ulster Scots will be launched at Queen’s University on May 29th. Musical book launch and wine reception. Institute of Irish Studies, 8 Fitzwilliam Street. 4 .30 pm. 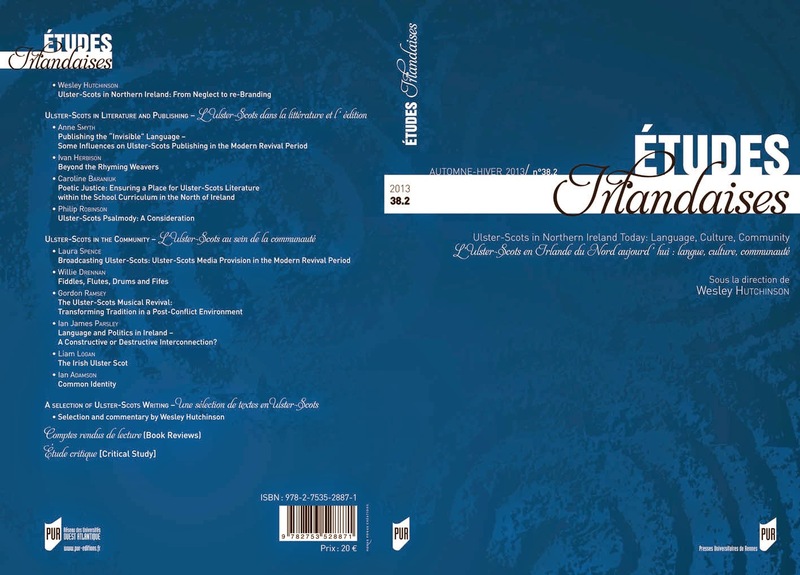 This special issue of Etudes Irlandaises tries to provide the reader with an idea of the ways in which Ulster-Scots fits into the cultural landscape of Northern Ireland today. It seemed important to move outside the often strident and ultimately sterile register that has characterised much of the discussion on Ulster-Scots, to challenge some of the (largely negative) idées reçues about it and to try to show the extent to which its impact has now gone well beyond the circles of the language enthusiasts to filter out into the broader community through publishing, broadcasting, educational projects, music, etc. The idea was to seek out material which would provide insight into the internal workings of the processes by which the Ulster-Scots cultural agenda is being put in place on the ground. Thus, all of the contributions come from individuals based in Northern Ireland, who at one level or another, have been closely - personally - involved in one or other aspect of this on-going and wide-ranging phenomenon. It is also important to note that this is the first time an entire volume of essays has been produced on Ulster-Scots in France and indeed in continental Europe. It is hoped that this will contribute to broadening the frame of debate on these issues. Since the rise in popularity of out of town shopping centres our traditional high streets have been in steady decline. The convenience of easy parking and a range of stores all under one roof means that battling to find a parking space on the high street before trudging up and down cluttered pavements, laden with various shopping bags, no longer has the appeal that it used too. Many attempts to rekindle our previous love affair with the high street have so far come to nothing. If our high street shops are truly to thrive once more then we need to have a complete rethink of what they should be offering the consumer. What many believe to be the high street’s one advantage is the unique shopping experience that it can potentially offer. An experience that invites the consumer to stay for hours, shopping at a relaxed pace in an atmosphere of creativity and friendliness. An area of destination shops and boutiques offering goods that are not readily available elsewhere combined with a coffee shop and wine bar culture. If this is our desired goal for our high streets then we have a long way to travel before we get there. Many of Northern Ireland’s high streets are now simply littered with betting shops and charity stores, interspersed between ugly, drawn down shutters that mark the graves of shops that have since permanently closed their doors. As a first step on the road to recovery we need to address these reminders of failure. Our high streets cannot recover if they remain uninviting places to be in. While it is not possible to simply create numerous thriving boutiques overnight and install them in every empty high street premise, it is possible to create that appearance. Instead of simply having drawn down shutters and boarded up windows we can install temporary shop fronts that give passers-by the realistic feel that they are walking past high quality shops. It would also give local artists and engineers’ opportunities to create their own businesses, by designing and creating better and more individual shop fronts that can be rented and moved from one place to the next as and when they are required. This tactic was first used in 1980s New York and has been repeated in many areas since, most notably perhaps during the G8 summit in Fermanagh and along the main routes to Stormont in Belfast. Failure only tends to breed more failure and our high street recovery will not take place until we first make them places that consumers want to be in and stay in. This approach is not without its critics however. Many existing high street owners feel that it merely covers over the problem without addressing the real practical business needs, such as lower business rates and long term planning. That if the failure is out of sight then the issue will remain out of mind. These are genuine concerns and it only goes to prove just how hard the battle to breathe life back into our high streets really is. As you head out of Broughshane along the Knockan Road, in the direction of Clough, you’ll soon realise you’ve passed through the Gateway to the Glens. The scene is picturesque, rolling rural with extensive views to the hills of Antrim. Idyllic landscape indeed: providing abundance of inspirational sight, sound and silence for the artist. It’s no surprise then that professional artists would take advantage of this environment to make this home and work base. In 2009 Hernan Farias developed a reputation in his native Santiago as a master photographer. Growing up in a working-class Chilean household, Hernan had a notion of photography but couldn’t afford a camera. One day he found a camera lying beside his car in a shopping mall car park. It looked like an expensive piece of equipment, so honest Hernan handed it over to the mall security. No one claimed ownership of the camera so the honest mall security people passed the camera back to Hernan and told him to keep it. So he had a camera but didn’t know how to use it. Not to worry, he sought out Polish photographer Wieslaw Olejinczak, recognised as one of the top fashion photographers in Chile. Hernan took lessons once a week for a year and then Olejinczak took him on as one of his assistants: for one year, before employing Hernan as his number one assistant in 2008. Hernan started to make a name for himself as a skilled artisan which resulted in him doing a major photo shoot for the international fashion magazine, Vogue. He had arrived; attaining a level of recognition in Chile, that when he had acquired his first camera, he could only have dreamt of aspiring to. He then set off to move to the far side of Broughshane. Judith explained that this was partially to do with a bad case of ‘home is where the heart is’ and also the fact that the education system in Chile was considerably inferior to that of her homeland. They have three children. They moved here in 2009. Judith had spent a year teaching English in Spain before moving to Chile, where she met Hernan and lived there for nine years. 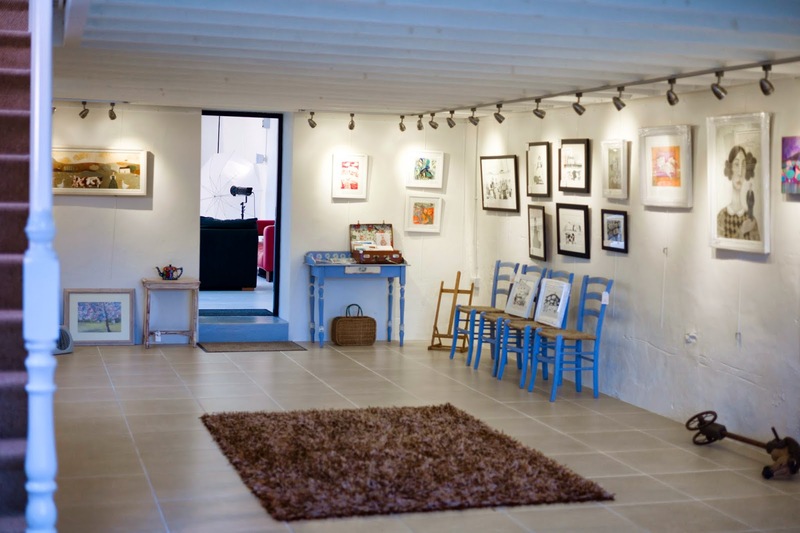 To the rear of their beautiful home they have converted a farm outbuilding into a shared studio and a gallery. Judith’s art is captivating as you walk through the door. It is folk art and has been described as naïve figurative with influence from the Renaissance period. Much of it is rural, in sync with nature, in sync with the Maker’s art beyond the gallery windows. It is feminine dominated: it is the end result of an artist who has found a oneness with her art form, expressing her inner character with confidence. The ground floor is a gallery filled with the captivating imagery of Judith’s paintings with Hernan’s photo studio adjoining. Upstairs is the art studio. The building itself has been converted with art-felt tastefulness. The old is retained with the brightness of modern: the wood burning stove securing the ambience of warmth. For Judith she is fulfilling her dream life, re-bonding with her family circle in the land where she grew up. For Hernan of course it is not quite as simple. His story is typical of the challenge that faces any new immigrant to this country. Ulster folk are renowned for being a warm friendly bunch but generally we’re not that great at understanding and fully accepting people from foreign lands. This stems from the fact that we have lived among our ain folk for generations and have developed unique subtle forms of communication through distinct local forms of speech and body language. Much often gets lost in translation and we don’t easily comprehend the challenges that face those from beyond the hills, never mind beyond the sea. Having said that, Hernan is gradually getting the message across that he is a master of his trade. He did get off to a fortunate start. Just after he had moved to his somewhat secluded rural home he started to promote his work on Facebook and was noticed by international fashion model, and former Miss Northern Ireland, Lucy Evangelista. Lucy was impressed by his work and was discussing, on Facebook, the possibility of engaging the Chilean photographer for a photo shoot. Lucy enquired whereabouts he had moved to in Northern Ireland, Hernan told her he lived near Broughshane. Lucy replied, “I live near Broughshane as well, where are you exactly?” “On the Knockan Road” he replied. When Hernan gave Lucy more details of the exact location and description of his house she was silent for a moment before informing him that she was looking out her window across the road at his house. Social media was designed to be global and not meant to facilitate business meetings with your closest neighbours. In this case the rules were broken. The now London-based, globetrotting former Miss Northern Ireland was his first professional photo-shoot outside of Santiago: he has been much sought after since. You too can communicate with Hernan on Facebook or through www.hfphotography.co.uk. Judith’s paintings, prints and cards are also on display in Belfast at Charles Gilmore Gallery, in Holywood at The Yard Gallery and in Bushmills at the new Gallery 1608. Theatre at the Mill and Theatre at Twadell. What do Newtownabbey Borough Council and the Parades Commission have in common? The answer to the above is that they have both made decisions that have interfered with liberty and freedom of expression. They both demonstrate the extent of intolerance that pervades society in Northern Ireland: that cripples prospect for progress towards a modern progressive tolerant society. The banning of the Reduced Shakespeare Company’s Bible play by Newtownabbey Borough Council, from performing at their Theatre at the Mill, was like a blast from a former age. No doubt a satirical play based on the Bible will contain material that some Christians will find hurtful. When this play was first conceived the authors would have had this in mind and would have gambled on protests to ensure box-office success. In this case they probably had their folk on the ground calling up DUP councillors to complain on their behalf. The fact is this; there are people in our society who actively want to suppress the freedom of speech and expression of those they disagree with. The best thing devout Christians could have done was to totally ignore the Bible Play, stay away from the performance to avoid offence and not offer it massive media attention. Too late for that now. I had never heard of the Bible Play or The Reduced Theatre Company until it was banned. 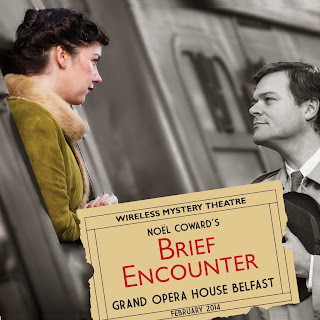 On the brighter side the Newtownabbey Borough Council had a re-think and the play was able to go ahead as planned. The same thing has yet to happen with the banning of cultural expression on the Crumlin Road last July 12th. The difference in this case is that the Parades Commission seems to have the general backing of the media and a majority of politicians to uphold this enforcement of intolerance. The issues may be more complex than with the Bible Play but it’s exactly the same principle in my mind. The solution for those who find Orange or Loyalist parades offensive is exactly the same. They should just ignore them, stay away from the performance to avoid offence and not offer them massive media attention. Too late for that now. The Twelfth of July celebrations in 2014 will surely be the biggest in recent times and the international media will be here in force. Is it stretching imagination too far to consider the possibility that Loyalists often surreptitiously complain to the Parades Commission in order to promote Loyalist culture?